Sit outside on this loveseat with your significant other and enjoy the brisk afternoon breeze with a pair of refreshing drinks close at hand. 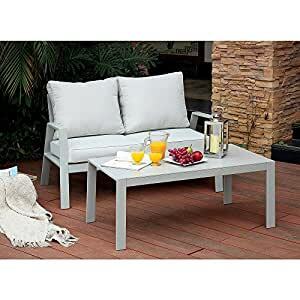 The padded cushions along the backrest and seat cushions provide plenty of comfort as you relax out under th e sun, leaning against the sturdy metal armrest. Rain or shine, this comfy collection with plank style tables are the perfect outdoor fixtures for a fun time in the open air.